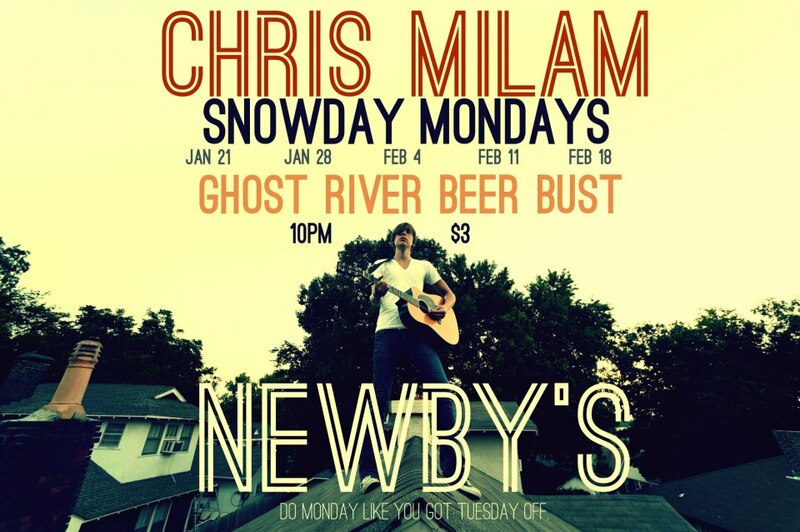 Starting this Monday night, Chris Milam will begin his Snowday Mondays residency at local college bar Newby’s. Every Monday night starting January 21 and ending February 18, Chris and his full band will provide you with exciting live music beginning at 10 p. m. that’s sure to kick your week off right! Oh, and did we mention? Not only is the music good, it’s cheap, too. The cover each week is a measly $3. To top it off there’s a $10 Ghost River Beer Bust every night as well. (For the uninitiated, that means you drink all the Ghost River your heart desires for just ten bucks.) So come on out and warm up with some great live music this winter season. It’s time to do Monday like you got Tuesday off. Be sure to check out the Facebook event here.